The Milton Public Library has been an integral part of the Milton community since 1855. It currently serves a population of more than 110,000 through two physical libraries and the MPL website. Every week, over 7,000 people come through the Library's doors (at Main Library and Beaty Branch) to enjoy our services, programs and collections, in addition to the more than 6,000 who visit us online. The Milton Public Library empowers the community to: Read. Learn. Create. Connect. Each year we offer a wide variety of programs and services, including special programs for children, teens, adults and the multicultural and business communities. Your library card is your key to access a wealth of materials and services. A library card is free to those who live, work or attend school in Milton. Become a member today! In June 2013, Milton Town Council approved the selection of Monteith Brown Planning Consultants to work with the Community Services Department and Milton Public Library in the development of their separate Master Plans. Over the past two years, feedback has been solicited from the community and a draft document was made available online over the summer of 2014 for comment, followed by public input sessions in September 2014. Such input from the community has helped us to develop recommendations that will guide the future direction of library services in the Town. These recommendations address current and future library service needs to ensure Milton Public Library continues to provide the highest quality services and the best value. This includes planning for the next library branch within a shared community centre. 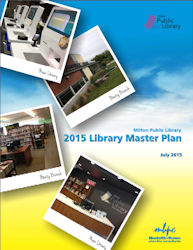 The Milton Public Library Board approved the Library Master Plan at a special meeting of the Library Board held July 29, 2015 and the Library Master Plan, as recommended by the Board, was formally accepted by Town Council at the August 24, 2015 meeting. We thank you for your feedback about Milton Public Library.